I love to think of fun ways to get through the winter – here in New York it can be pretty brutal so indoor activities are always a plus. 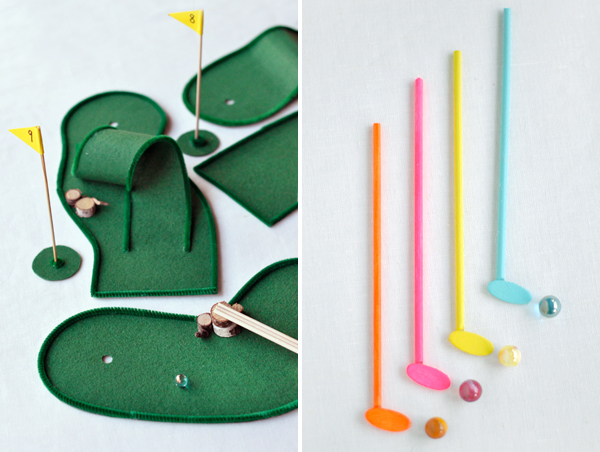 This tabletop mini golf course brings the outdoor fun inside so you can play during any season. 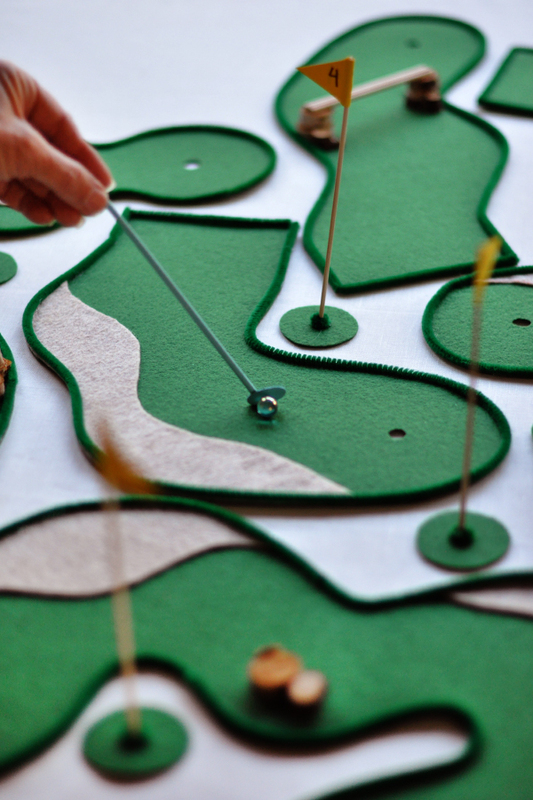 You can design your course to be as challenging as you like and add all the special features you can think of. Set it up as a fun party activity on those cold nights. Step 1: Sketch out your course. I decided to do nine holes and keep the shapes pretty simple. Step 2: Cut out the shapes out of the green felt. Cut a half inch circle in the felt for the hole. 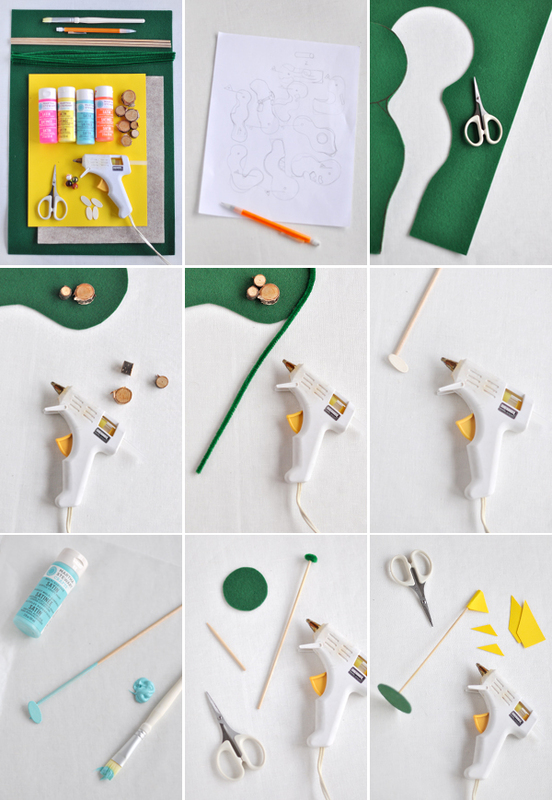 Step 3: Attach your extra hazards to the course: glue on mini log slices, rocks, or other tiny features. 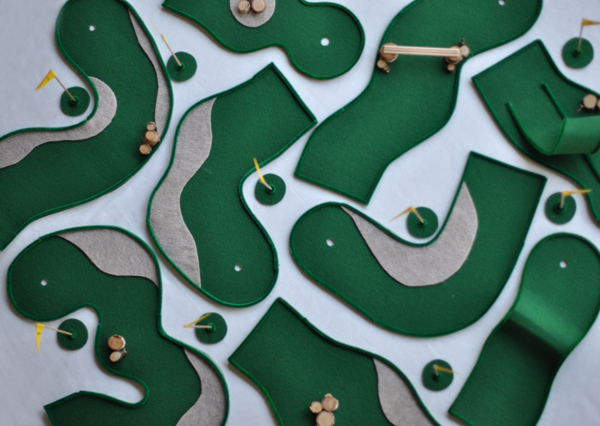 Cut out shapes from the sand colored felt to add sand traps. Step 4: Glue the pipecleaners around the edge of each hole. Step 5: Glue the small wooden oval onto the end of a dowel so that it is at at little more than a 90 degree angle. Step 6: Paint the clubs. Cut the handle to the desired length. Step 7: To make the flags, glue a small piece of pipecleaner around the end of a dowel. Next, cut a two inch circle out of the green felt and glue the pipecleaner end of the dowel into the middle of it. Step 8: Wrap a one inch strip of yellow paper around the top of the flag and secure with glue. 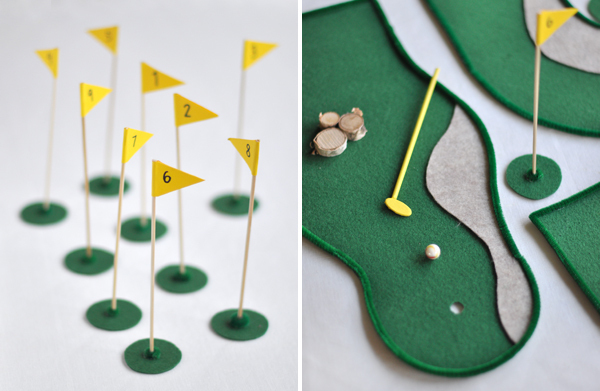 Cut into a flag shape and draw on the numbers with the felt tip pen. 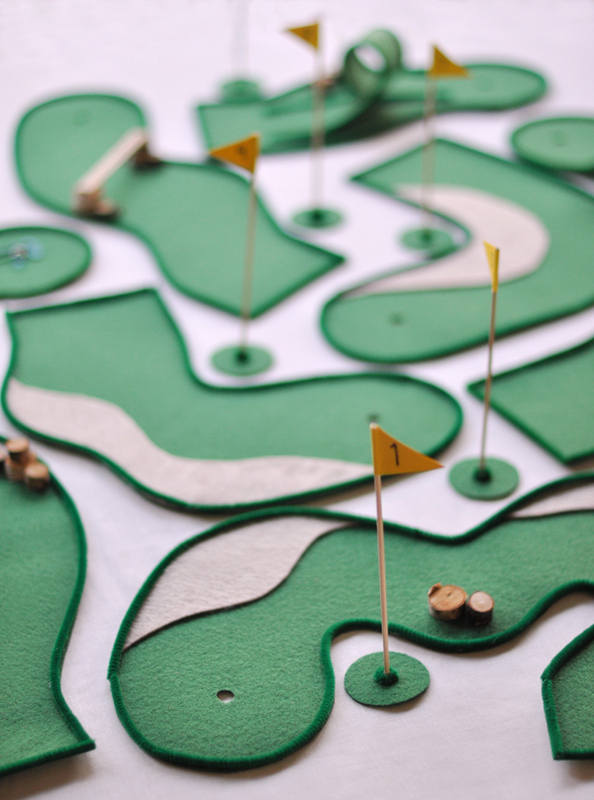 how cute is this mini golf game!!! Wow, what a super cute idea! As a sort of collector of mini games, I absolutely love this! Too cute!